This direct oceanfront ground floor unit offers a breathtaking view of the entire Napili Bay and beach, as well as the gorgeous Pacific island of Molokai. 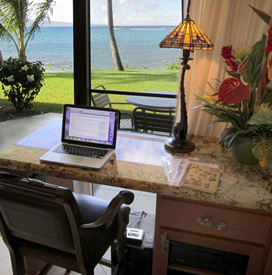 Directly in front of you is all the excitement and grandeur of waves breaking over rocks a few yards from your bed and the crescent of beautiful white sand of Napili Bay. A-103 has been completely gutted and luxuriously decorated, and features exquisite granite counter tops and dining peninsula, custom tile, an elegant kitchen, plasma TV, wireless internet, custom African mahogany breakfront, desk, kitchen and bathroom cabinets, the one and only private washer/dryer combination on the property, a Queen Murphy bed, and two comfortable single beds which will accommodate four people. The Napili Shores development is known for its extraordinary Pacific views, two pools, hot tub, poolside barbeque, two outstanding on-site restaurants, manicured tropical grounds, and many additional amenities including tennis and championship golf courses nearby. Unit A-103 has always been known as having the best view. Now people are also calling it the most comfortable, equipped, and luxurious – all at affordable prices because you are renting from the family who owns it and is renting it the days they are not able to occupy it themselves.